We use Google Analytics for monthly reports, investigating issues, monitoring performance in various channels and much more. But sometimes, when you’re swamped with work or just distracted by other things, there isn’t time to delve into Google Analytics and look at the data on a regular basis. This potentially means two things; that we’re missing potential issues and we’re also not noticing uplifts that we could be celebrating! The good news is you can use a variety of custom alerts to notify you of these things as and when they occur. 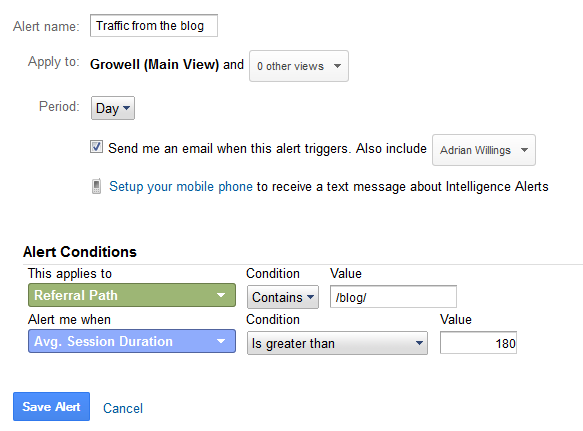 You might be wondering what custom alerts are and why you’d use them over just looking at the data in Google Analytics. Well, the answer is simple, if you’re anything like me you don’t have the time to delve into your data and check it on a daily basis. So there’s every chance you’re missing important information about problems with your site or even not noticing when something has improved until perhaps the end of the month when you’re examining that month’s achievements. Custom alerts are great because they can quickly alert you to these issues with a simple email in your inbox with a frequency you can set yourself. Since custom alerts can be setup to monitor almost anything you can save yourself a wealth of time trawling through reporting data to find answers to your questions. 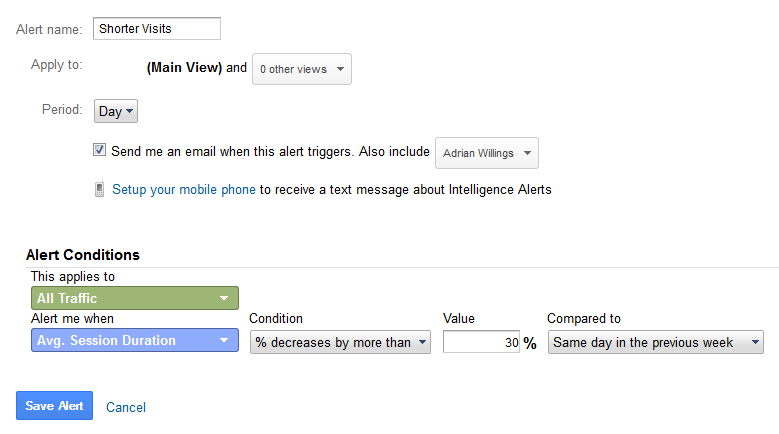 You can also tweak alerts according to your site’s performance or needs. There are two main uses of custom alerts. The first is tracking, monitoring and reporting on problems, errors and issues with the site. This is probably the most valuable as it will give you insight into major issues that need addressing to prevent loss of revenue or leads. There are a few key elements to each custom alert, the most important of which is that little box that says ‘send me an email when this alert triggers’. Otherwise you might as well not bother setting them up in the first place. I talked previously about using goals and custom alerts to monitor increases in errors on the site which might point to hacking issues. I won’t cover that ground again here, so take a quick look at that article as you won’t want to miss out on that info! 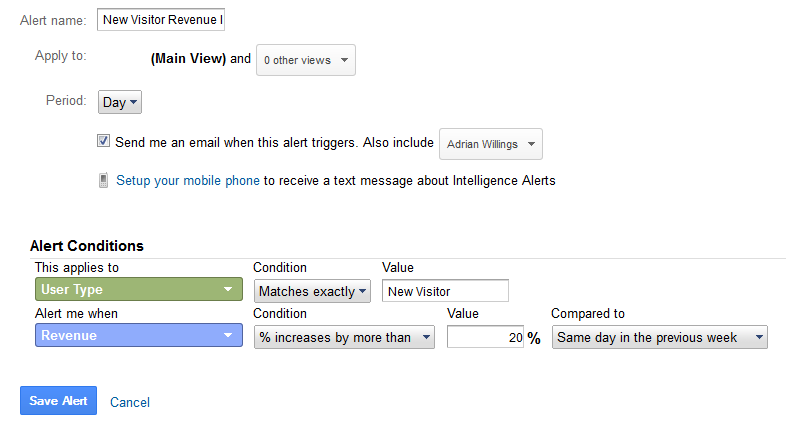 As a marketer, there’s nothing worse than a problem with the site (or code) that causes loss of Google Analytics data. Such a problem leaves a gaping hole in your reports that can never be filled and that problem will haunt your year-on-year data for months to come. It could only be worse if your site was hit with a Google ban and dropped from the rankings! So this custom alert is probably the very first alert you should think about setting up. It’s pretty straightforward, you’re telling Google to monitor for a situation where there are less than 10 sessions on your site in any given day. You may choose to set a higher value but bear in mind those days (such as weekends or bank holidays) where your traffic may naturally drop below this threshold anyway and you’ll get alert which doesn’t actually highlight a problem. At first glance this alert might appear similar to the last. We’re looking to be alerted when there’s a decrease in sessions. However, where the first is designed to tell you when there’s basically only a handful of visits (if any at all), this one is intended to highlight a significant drop in traffic which points to a problem with your Google rankings, your paid search campaigns and other marketing efforts. NOTE – it’s a good idea to set this alert to compare data to the same day in the previous week. Otherwise you’ll be bombarded with email alerts on your quiet periods (e.g. on Sunday). This alert has multiple uses because an increased bounce rate could mean multiple things depending on your business, marketing efforts and circumstances. An increased bounce rate after the launch of a new website might be extremely bad news, while an increase after the launch of a new blog section (and lots of content) might not be as much of a problem (blog articles naturally have a higher bounce rate). Depending on what you’ve been doing and how significant the change is, a bounce rate might point to problems that need investigating further. Note – you’ll need to change the value of the bounce rate according to your current bounce rate and a level that you find acceptable/logical according to the nature of your website and its contents. 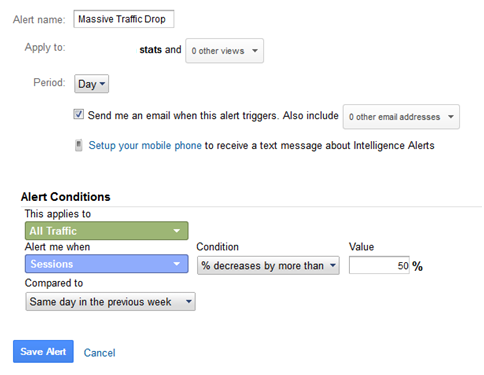 You might consider creating separate alerts for different sources of traffic (e.g. organic, paid, social) to monitor the success of campaigns in those areas. Logic dictates that a slow loading website is a large problem for your business. Visitors who have to sit and wait for your site to load will get frustrated, bounce away and visit your competitors. This problem is compounded on mobile devices where speed is key. This alert is intended to highlight problems with your page load speed that have occurred over time. It could point to problems with your new site design, issues with recent technical updates or even hosting troubles that need addressing. Note – this alert is comparing on a monthly basis to stop you getting warnings of small (unusual) fluctuations in load speed on a regular basis. You may also choose to adjust the value to a increase that you find acceptable. This alert goes hand-in-hand with the bounce rate alert but will pick up on issues where suddenly people are spending less time on the site. This could be caused by many different things and might not necessarily indicate a problem – for example if people are getting exactly what they need straight away (and then calling) they might not need to spend as long on the site. While people spending longer on the site could indicate they’re struggling to find what they need. This sort of data could be interpreted differently depending on your data, your audience and search trends. Still, it is a worthwhile change is data to monitor for obvious reasons. 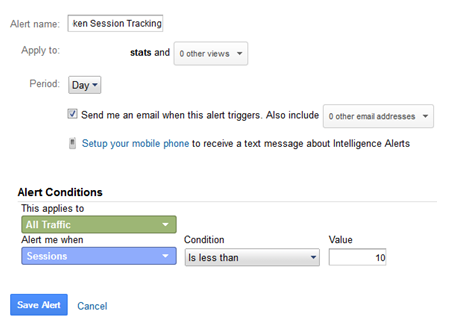 Note – this alert is set to compare to the same day in the previous week for the same reason as the alerts for session tracking. Audience trends might results in shorter visits at certain points of the week. A drop in conversion rate can occur for many different reasons – broken tracking, seasonal trends, poor user experience, broken forms, etc. This alert warns of the problems and helps you to tackle them ASAP. 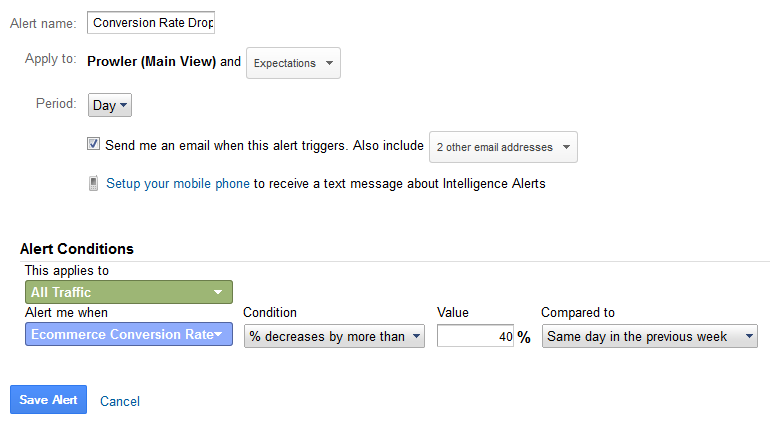 You may choose to adjust this drop according to your data and fluctuation to avoid being bombarded with emails. 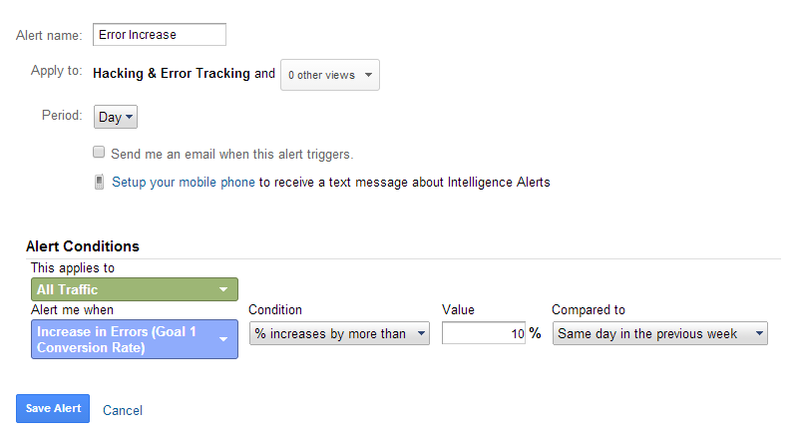 Note – you may choose to setup different alerts for drops in different conversion rates. For example, an e-commerce site may have both an checkout conversion rate to monitor and a contact form (or other lead generation form). Banish this kind of problem by using this alert to monitor when Google Analytics is reporting a sudden (massive) drop in revenue. This might highlight a variety of issues, but hopefully nothing that can’t be fixed with a quick update! Note – you may choose to adjust the ‘value’ according to your needs for faster alerts to issues. As well as monitoring (and reporting) on problems on your site, it’s important to monitor success of your efforts. It’s all too easy to miss an improvement in your site if it’s a fluctuation or marginal increase or a blip, but knowing about it might let you work out why it happened and adjust your efforts to capitalise on it. This alert necessitates the existence of a blog on your website, but may help alert you to an element of success from your blogging efforts. It simply highlights when longer sessions are occurring where people have visited any article on your blog and carried on viewing the site. Note – you may have your blog setup in a different location so adjust the ‘value’ accordingly. This goal will allow you to know when more people are completing the enquiry form. This may be a good talking point and proof of success of any site changes you’ve made or just generally show an improvement in the leads the site is driving because of the marketing you’ve been carrying out which has lead to increased traffic. 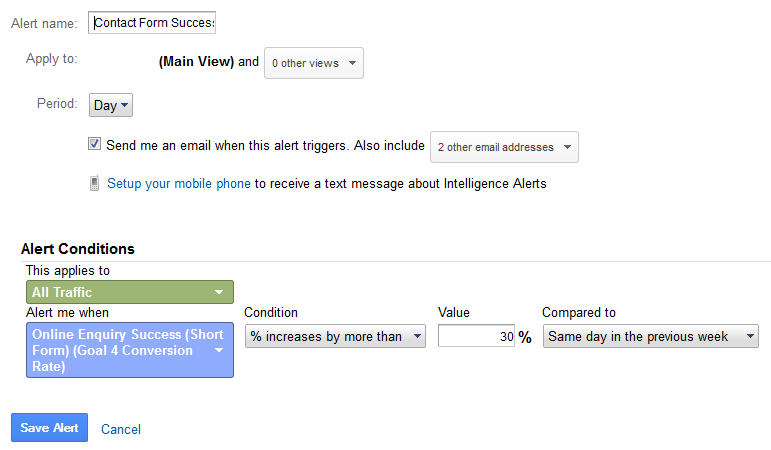 Here you’ll first need to setup the enquiry goal on the contact form and then use the goal’s conversion rate as the measure of success with a marked improvement triggering the alert. This is the same alert as above. The main difference here is we’re looking for specific data around new visitors. 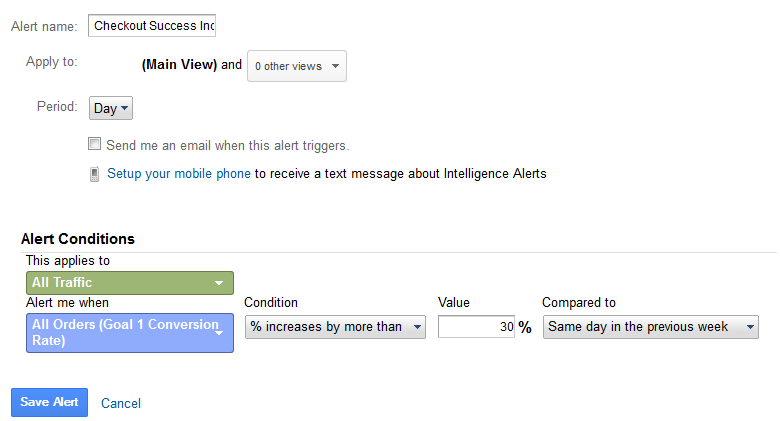 Here the alert tells us when your site is succeeding in converting new visitors, which is obviously an important goal. For an e-commerce site the success of your checkout is a key part to the success of your website. More completed orders hopefully means more revenue (unless your average order value has dropped for some reason). So knowing when this happens is a good way to report on improvement and monitor the success of your efforts. Note – this alert requires a goal to be setup for the checkout process so it can monitor improvement. What’s better news for an e-commerce website than an increase in revenue caused by new visitors? If your service is good enough, an increase here will also mean an increase in returning visitors and thus overall revenue. Good times all round. 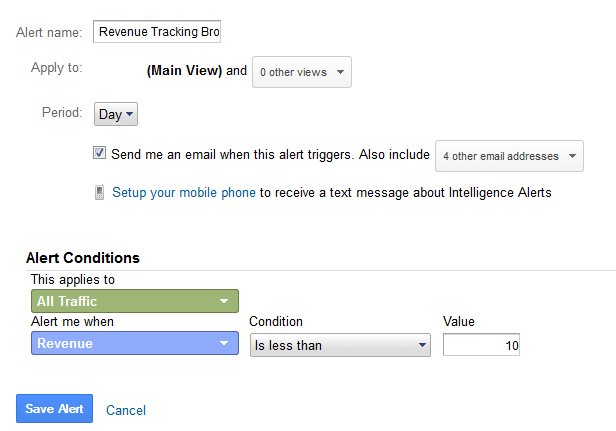 This has just been a quick summary of the vast possibilities of custom alerts. Hopefully you’ve seen the value and feel free to leave ideas of other alerts in the comments or get in touch with us to discuss more!